Region: This Caterpillar is found east of the Rockies through the northeastern United States and southeastern Canada. Life cycle: This insect produces two generations each year and overwinters in a cocoon. 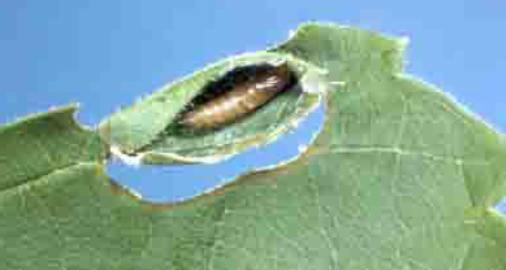 The first generation forms a cocoon by folding over a section of leaf and securing it with silk. The second-generation larvae usually drop to the ground and form cocoons enclosed within a fallen leaf. The eggs from the second generation are laid from late July through August. Physical Description: This 1/2 inch long caterpillar is white or cream in color at first, then becomes green and then purple if they feed on deep blue berries. The adult moth is gray to purple with a wingspan of 1/2 an inch and is distinguished by tan forewings with sharp areas of dark brown. The flat, disc shaped eggs are cream colored and are laid on stems, flowers, or berries. Feeding characteristics: This pest attacks grapes by webbing together berries and leaves as they feed with a silken substance. Red spots show where the larvae enter and later the spots often turn purple and berries may split as they grow. Affected berries often ripen prematurely and fall before fully grown. Controls: Since the moths pupate on the ground in winter, early cultivation will often bury the first generation of caterpillar. The pupae fall prey to Ground Beetles, Ants, Spined Soldier Bug and several parasitic wasps. Remove all debris and fallen leaves after grape harvest and, if necessary, apply Bacillus thuringiensis.